Seven people died, including three children, when the family's SUV hit a concrete divider on the Bronx River Parkway, veered off a bridge and fell onto the grounds of the Bronx Zoo. Speed was a factor in the crash, police said the vehicle was moving at 68 mph in a 50 mph zone. The Bronx River Parkway is a glaring example of the deficiencies we see on area roadways, these roads were never envisioned as being the commuter arterial roadways that they are now. The roads are twisty. They are hilly. The lanes are narrow. There are no breakdown lanes. The on-ramps are too short." New York City saw more than 200 people killed in traffic accidents in 2011, the lowest total in at least a century, according to the city's Department of Transportation. A majority of those deaths involved pedestrians struck by vehicles on sidewalks and streets. Excluding pedestrians and bicyclists, the death count was 82, meaning you are many times more likely to die of accidental poisoning in New York than in a car wreck. Most of the deaths were on surface roads, not highways, although last year's deadliest crash — a bus wreck that took 15 lives — happened on a wide-open stretch of I-95, right at the city limits. By comparison, North Carolina, a state with a population not much larger than New York City, typically has more than 1,300 motor vehicle fatalities per year. National statistics have long shown that the highest death rates, per mile driven, are on rural roads where people can go fast and maybe get lulled into complacency. The national average for motor vehicle fatalities in 2010 was 1.11 deaths for every 100 million miles traveled by vehicles. That's nearly twice the fatality rate of 0.64 in urban areas in New York state. The question is, how can you prevent this tragic accident to occur to you? Here are 6 steps to help you prevent getting into an accident on the highways and local roads. If you are going to go on a long road trip and you have young children on your vehicle, you must make sure that your children are in a child seat (if they require a child seat) or that they must have their seatbelt on. Besides, because of the obvious that you should always have a seat belt on for safety reasons, a child without a seat belt on, can become a major distraction for the driver, When you are driving at a high speed your attention should be 100% on the road, because all it take is one second of distraction and you can lose control of your vehicle. Your attention should always be 100% on the road when you are driving, but specially when you going 50MPH or more. Pay attention. 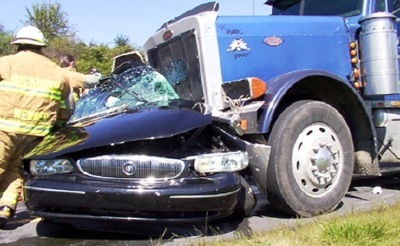 Practically all collisions involve inattention on the part of one or both drivers. Distraction comes in many ways: daydreaming, fidgeting with the radio, sleepiness, fatigue and cell phones. Paying attention makes it possible for you to see, recognize and avoid the hazards approaching on the road. When it comes to having a vehicle, you will have to spend money in making sure that your vehicle is well maintained, specially when it comes to your tires and brakes. In the Below picture you can see an easy way to determine whether your tires still have tread on them, or if your tires have become worn out. Hold a penny with Abraham Lincoln upside down. Insert the penny in the space between your treads, pull it slightly forward so that the penny is touching the tread and check out how much of Mr. Lincoln’s head you can see. If you can see his entire head you should probably be thinking about some new tires for your vehicle. You should always make sure that your Brakes are in good working condition and are not worn out, usually if you need for your brakes to be changed, you will begin to hear a grinding noise coming from your tires when you begin to press on the breaks. The most vital step is to get your vehicle in top form. Whether you're traveling by car, RV, truck, motorcycle, your road trip will be smoother if your vehicle is ship-shape, or road-shape in this instance. Before you leave, have a qualified mechanic check all the car's vitals: brakes, battery, fluid levels, tire pressure, light bulbs and any parts that need regular maintenance. As with all long-distance road trips, it's wise to bring emergency equipment such as a first-aid kit, flashlight, blankets, drinking water and snacks, along with flares and jumper cables. Check the weather for your route and be prepared for snow and ice with an ice scraper and even if posible chains for the tires. Step 3: You can not tell the future. You can never rely on what the other driver will do. While driving, always keep a wary eye on other drivers and leave yourself plenty of room. Anticipate the mistakes they might make and be ready. Stay alert and in control. If you are in doubt about who has the right of way, give it away. Right of way rules are often misunderstood, and there are situations where the rules may not be clear to everyone. If there is uncertainty about which vehicle should have the right of way, give the other driver the road. When it comes to driving safely, it's not the principle, but the outcome, that counts. Speed limits are posted for a reason. Driving at a higher rate cuts your reaction time and results in more stored energy that must be dissipated in any collision. A safe driver should choose a speed matching traffic as closely as possible without exceeding speed limits. If traffic is moving at higher speed than you should go, keep to the right and out of the way. Most everyone knows the basic traffic laws, yet drivers impatiently ignore them for the sake of expediency every day. Traffic rules are in place to create the consistency and uniformity that allow us to predict with some degree of confidence what other drivers will do, thereby avoiding conflicts and collisions. Ignoring the rules of the road helps create the chaos you see every day. There were an estimated 6,420,000 cars involved in accidents in the US in 2008. The cost of these accidents exceeds 230 Billion dollars. There were about 2.9 million injury cases and 42,636 car accident deaths. An average of 115 persons die each day in motor vehicle crashes in the United States, one every 13 minutes. 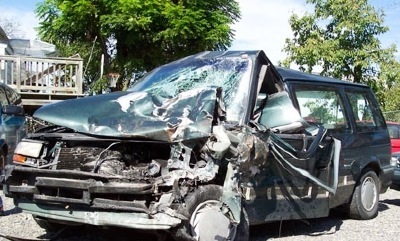 According to the World Health Organization about 3000 people die in crashes each day worldwide. The above picture happened on I-80 going westbound in Central Pennsylvania in September 2003. There was a 76 year old driver and 85 year old passenger. They turn on their left turn signal but they were in the slow lane (right lane). They then suddenly turned at 60 MPH right in front of the semi truck. Both women were killed and it was an incredibly ugly scene. 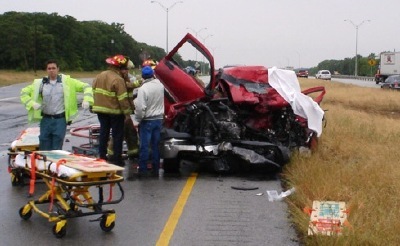 The fatal Vehicle accident on May 5th 2005 on I-20 in Smith Co. Texas. A Red 2002 Chevy 1500 Extended Cab Pickup was traveling westbound on I-20, was driving too fast during a rain storm and began to hydroplane. The pickup crossed the median and struck a tractor trailer head on. There were 5 occupants in the pickup truck. The 30 year old female driver was killed on impact, a 28 year old woman was in the front passenger seat had to be extricated by Jaws and was taken by helicopter to the hospital in stable condition. There were 3 children in the back seat (none wearing their seat belts) A 3 year old girl was in the back seat behind the driver, was thrown into the bed of the pickup and killed, a 12 year old girl in the middle was killed on impact and a 15 year old girl in the passenger side had to be extricated and was taken to the hospital by helicopter in stable condition. The driver of the tractor trailer was not injured in the accident. On September 5, 2003, 5 people were injured in a head-on collision. Their were 3 people in the van pictured above. They were on the way home from the Outback steak house on Rd.45 Martinsburg , West Virginia. When they came around a sharp turn a jeep with no headlights and 2 drunken people, came left to center and hit the car head on. The jeep ramped up onto the car and flipped. The driver ended up with a broken pelvic bone, broken femur, broken ankle, and 5 broke rib bones, which punctured his lung. The other passenger walked away with a broken ankle, and scrapes on his head. One of the passengers had to be transferred by ambulance to another hospital, in Virginia. One of them had his legs burn, stretching 5 inches in length, and 3 inches width. They also had bleeding in the brain, and swelling. In the jeep, the driver got ejected onto the road; he broke all the bones in his face, and got most of his teeth knocked out. They were not wearing seatbelts. Luckily everyone lived, but the paramedics, said they shouldn’t have. Brand new 645 BMW was going about 125 MPH when he hit the rear end of a Bob-tailed Tractor trailer. Really says something about the safety of the new car designs. This happened about 2 Kilometers East of Kaiserslautern, Germany on Autobahn 6 back in early March of this year. The driver of the BMW is a 24 year old star for the Kaiserslautern Germany professional Soccer Team. Car cost about $100,000 or more according to the Polizei. He hit the back end of a Bob Tail AAFES truck and spun him 180 degrees around so he was facing the oncoming traffic. The guy I was riding with was about 300 Meters behind the AAFES truck and saw the whole thing happen. BMW driver was doing about 200 90 mph in the left of three lanes then a small car cut him off. The only option the BMW guy had was either hit the little red car that cut him off or dive into the center lane where the AAFES truck was.